Toyota, the first company in the world to build ten million vehicles, came out with the Camry-based Highlander in 2001, having announced its anticipated arrival at the New York Auto Show in April of 2000. It has been a sales success, racking up in excess of 1.5 million units sold to date. For 2015, Toyota’s Highlander carries forward its renewed styling that was rolled out in 2014, and is currently in its third generation iteration. It is a car-based mid-sized SUV with seven-passenger, three row seating. 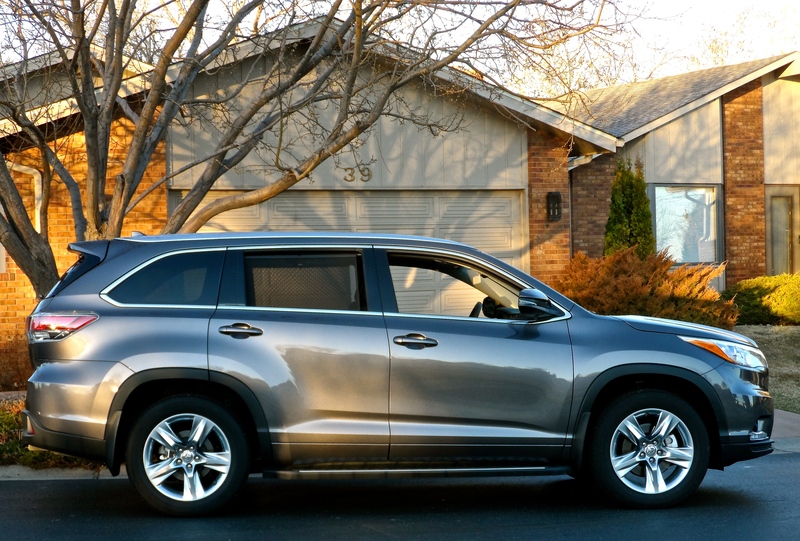 Sales of the Highlander (146,127 in 2014 – a record) places its revenue right in the middle of the Toyota SUV lineup. The Toyota RAV-4 is the only model that produces more sales for the company than the Highlander. This past week I was able to test a Highlander, a Limited top-of-the-line unit that carried an M.S.R.P. of $47,812.00, including freight. The Limited’s base price was $41,300.00, and had as options a BluRay rear entertainment system ($1,810.00), driver technology package ($1,400.00), tow hitch/wiring harness ($699.00), side running boards ($599.00), remote engine start ($499.00), floor/cargo mat package ($225.00), and paint protection film on the front end ($395.00). 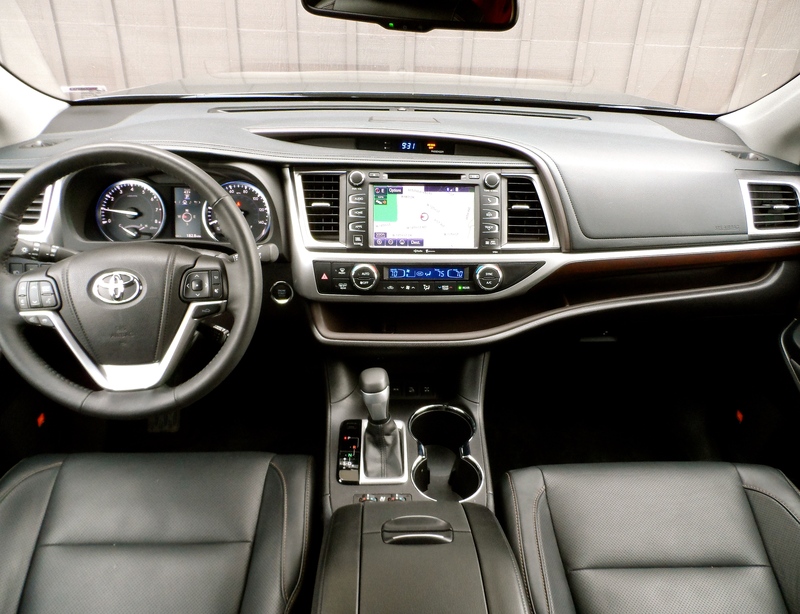 The Limited Highlander included a safety technology package, a moonroof, and perforated leather second-row captain’s chairs. The extra technology equipment included radar adaptive cruise control, automatic high beam headlamps, blind spot monitor, lane departure alert, and pre-collision warning. Additional Limited model items on my test car included power liftgate with glass hatch, 19” five-spoke alloy wheels, anodized roof rails, three zone climate control, JBL/Entune/navigation with 8” screen (the rear screen was 9″), perforated black leather seats, pushbutton starter, proximity keyless entry, tilt/telescope, heated and air conditioned front bucket seats, backup camera, and nice Optitron instrumentation. Styling, with the 2014/2015 revision, was great. So was the opulent-looking Predawn Mica gray paint, “Limited” badging, and polished Chromtec finish on the wheels. The tires mounted on the alloys were 245/55R19 Bridgestone Dueler H/L 422 mud and snow radials. The running boards on my tester added in both the utility and the styling departments. Power for the Highlander is supplied by a 3.5 liter V-6 with 270 horsepower and 248 lb. ft. of torque. The transmission is a six-speed automatic with snow mode and full-time four-wheel drive. A unitized body is employed and four-wheel independent suspension and disc brakes are, as well. EPA fuel economy ratings are 18-city and 24-highway, with a combined rating of 20. For the week that I drove the Toyota, my observation was of 24.1 mpg. Weight is 4,508 lbs., towing capacity is 6,000 lbs. and the fuel tank holds 19.2 gallons. Overall length is 191.1”, 3” longer than the second generation Highlander, and cargo volume behind the third-row seat is 13.8 cubic feet. With it folded down, that number increases to 42.3, and with the second- and third-row seats folded flat, total cargo capacity is 83.7 cubic feet. I enjoyed the styling, interior comfort, visibility, road noise (lack of), and guidance of the Highlander. The ride was satisfactory, and I feel that this year’s Highlander makes a nice family hauler and/or travel vehicle. The U.S. public agrees with me, and great sales numbers are the result for Toyota.